April 13, 2016 | ProgressTH Taking care of human health is not like fixing a car or a computer. Not only is there a wide range of conditions that can inflict a human being, but each human being also has a unique personality and ability (or inability) to deal with that infliction. Navigating this complicated challenge are doctors and nurses all over the world who must confront and overcome these unique challenges on a daily basis. Often these challenges require inventive solutions that are hacked together on the spot using material already on hand. For such solutions that deal with recurring problems, healthcare professionals might consult a biomedical design firm to produce a finalized and marketable solution. However, this takes time and money. What if there was a better way? A cheaper way? A faster way? Makerspaces are exactly what they sound like… spaces in which you make things. Beyond semantics however, makerspaces generally also imply the presence of modern prototyping and personal manufacturing technology ranging from opensource electronics and development boards, to computer-controlled laser cutters and mills, to 3D printers. 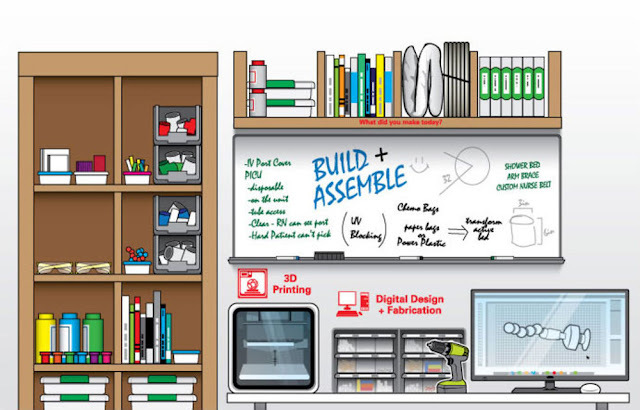 Within a makerspace, inventive people can create virtually anything. Some of the first mainstream 3D printers themselves were produced within a New York City makerspace called “NYC Resistor.” One of the first community labs, GenSpace, also came out of this makerspace. Thanks to a growing network of makerspaces around the world, distributed projects like the eNABLE 3D printed prosthetic limb initiative has been able to make an impact in ways traditional, centralized institutions and foundations could never have hoped to achieve. Imagine if this concept of distributed research, development, and local manufacturing was applied to human health with direct input from healthcare professionals themselves. For the last two years, it's been documenting and archiving ideas from nurses who make things that help them improve patient care (think: glow-in-the-dark pill bottles, catheter protectors). And, now it's enabling actual prototyping and development from a unique maker-space at the University of Texas Medical Branch hospital, in Galveston. The site contains digital fabrication equipment like laser cutters and 3-D printers, so nurses can design on-screen. It has a electronics section for adding intelligence to things, and a range of assembly and curator tools. There's also a human "facilitator" on-hand to help the nurses, and the space invites in makers-in-residence from the local area. Already, many useful ideas have come out of this makerspace. That’s because it is merely helping facilitate more efficiently what doctors and nurses have already been doing, all over the world, throughout the history of medicine. That is, improvising when necessary. The basic setup of MIT’s MakerNurse makerspace is not beyond the budgets of local communities throughout much of the world. In Bangkok, Thailand, many hospitals already have their own innovation department which takes ideas developed by nurses, contacts designers and manufacturers, and creates finalized and professional solutions. The money and time used to accomplish this could be used instead to develop these solutions in-house, at a fraction of both the time and cost of traditional methods. The initial cost of 3D printers, a design studio, and the odds and ends required to assemble final prototypes and items will be quickly offset by the increase in volume and turnaround time required to get new ideas from nurses and doctors’ heads and into a tangible object. 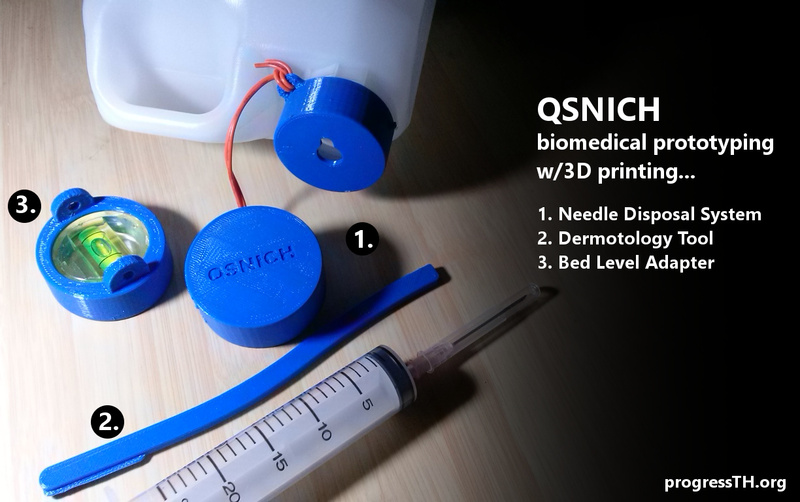 Bangkok’s Queen Sirikit National Institute of Child Health (QSNICH) decided to partner up with our makerspace first, to explore the possibilities of leveraging 3D printing and other tools found at local makerspaces. The ability to produce working and professional-looking prototypes of ideas nurses and doctors had already designed, and the ability to create several iterations per week, has greatly quickened the pace of development. So successful is the collaboration, that the workload at the makerspace is becoming overwhelming. The ability to help other hospitals would be nearly impossible without other makerspaces popping up and sharing in the work. Thus the idea of putting a makerspace into the hospital, run by the hospital’s already existing innovation department, would make the most sense, with independent makerspaces providing support only when necessary for particularly demanding projects. 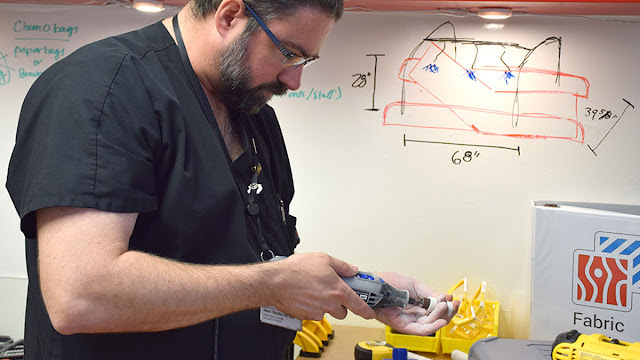 The projects developed in the hospital’s makerspace could then be marketed and sold to others through a manufacturer, or shared on free online 3D model repositories like Thingiverse (or both). Makerspaces are generally paid a freelance fee for their contributions toward supporting prototyping at local hospitals, just as the innovation department paid traditional design studios and manufacturers to produce finalized versions of their hacks. In the end, what we are looking at is a distributed biomedical industry, where those directly involved in implementing solutions also now have the ability to create those solutions by leveraging modern prototyping and personal manufacturing technology. Not only does it speed up innovation and reduce costs, it allows hospital budgets to redirect freed up funds toward other more critical areas. It is also part of finding a practical and sustainable solution to making healthcare more affordable to all.